The performance of the cathode materials can be enhanced significantly by manipulating the surface properties through a nano-structuring. Porous ZrV2O7 is synthesized, in the present study, by a facile one-step solution-based method wherein the proposed method and the ZrV2O7 have the advantages of less preparation time, low cost, small crystallite size, porous structure, and good electrical conductivity, which dramatically improves the electrochemical properties. The porous ZrV2O7 electrode exhibits the conductivity of 0.57 × 10−6 S/cm, which is close to the conductivity of the traditional cathode materials LiMn2O4 (10−6 S cm−1). 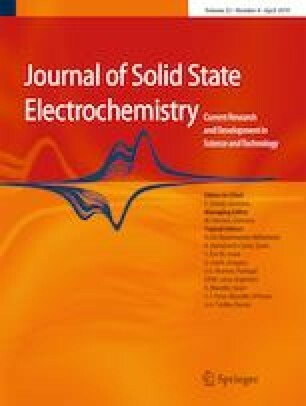 The galvanostatic charge-discharge results reveal that the porous ZrV2O7 delivers excellent discharge capacity of 159 mAh g−1 and 126 mAh g−1 at C/10 and 1 C (C = charge and discharge) rate, respectively, besides excellent reversibility. The online version of this article ( https://doi.org/10.1007/s10008-019-04212-w) contains supplementary material, which is available to authorized users. The authors express the sincere gratitude to the DSU management for extending constant encouragement. The author Ashoka S (SA) was financially supported by the Science and Engineering Research Board (ECR/2017/000743) Government of India. Nagaraju was financially supported by DST-SERB, Govt. of India, New Delhi (Ref. No. SB/FT/CS-083/2012).